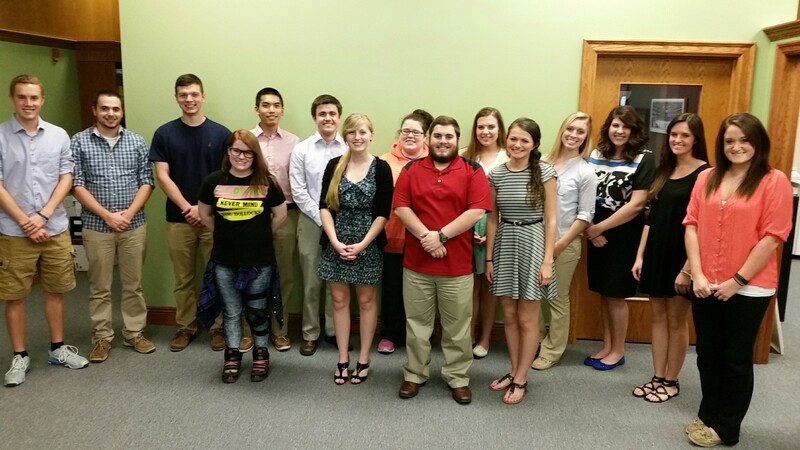 Wheeling, WV – The Community Foundation for the Ohio Valley (CFOV) welcomes 17 area college students to the 2015 CFOV Civic Leaders Fellowship Program. 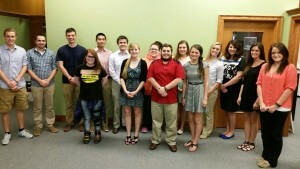 The program, now in its third year, began on May 29 with orientation at the Community Foundation. The students began working at their host sites on June 1. CFOV works in a partnership with the Parkersburg Area Community Foundation to offer local college students a paid summer internship working at area businesses, nonprofits, and government organizations for six weeks. The Civic Leaders Fellowship Program aims to enhance personal skills, improve ability to find meaningful employment in the Ohio Valley upon graduation, and to expand networking connections with area organizations, fellow interns, and local professionals. “This is the second year we have been fortunate enough to host an intern from the Civic Leaders Fellowship Program. “We are a strong proponent of the intern process throughout our operation, and this program has provided us with two exceptional students.” –Wesley Nickell, Vice President Finance, Kalkreuth Roofing & Sheet Metal, Inc. The students work Monday through Thursday at their host sites and will convene at CFOV on Fridays for a personal and professional development forum as well as several scheduled tours and team building activities. This program offers a collaborative way for employers, nonprofits and foundations to work collectively to improve our region’s potential workforce for the future. “The Civic Leaders Fellowship Program has helped to regenerate a love for my hometown and show me all the ways my skills can benefit Wheeling in the future. Through my internships I have gained experience in my field of work and I have seen the countless opportunities there are for my generation in the workplace in West Virginia”. –Samantha Dodd, Civic Leader. Host sites for 2015 include: Belomar Regional Council, Wheeling Convention and Visitors Bureau, Easter Seals Rehabilitation Center, Elmhurst, The Gabriel Project, Hays Landscape Architecture Studio, Wheeling-Ohio County Health Department, Kalkreuth Roofing, King’s Daughters Child Care Center, Main Street Bank, Oglebay Institute, Orrick, Herrington & Sutcliffe, Touchstone Research Laboratory, U.S. Bankruptcy Court, Northern District of West Virginia, Wheeling National Heritage Area Corporation, Youth Services System and The Ziegenfelder Company. Funding for the Civic Leaders Fellowship Program is provided by the Claude Worthington Benedum Foundation, the Schenk Foundation and the Mary Ann Hess Fund of the Community Foundation for the Ohio Valley. To learn more about the Community Foundation for the Ohio Valley and our Civic Leaders Fellowship Program, please visit www.cfov.org and click on the Community Leadership tab.